Through play, we lay the groundwork for learning. We help intellects grow and imaginations emerge. We support kids in their first efforts in making friends, nurture self-esteem and confidence, and teach about trust, tolerance, and respect. Kids’ social development is one of our most important concerns. The program is designed to respond to individual children at different developmental stages and to provide children with a strong foundation for future learning. Learning to pedal, to jump, to push helps children eventually learn to read, to understand numbers, and to develop reasoning skills. 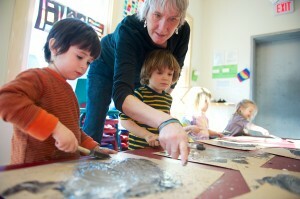 At Agassiz, cutting paper, playing with blocks or balls, laughing or making muffins is all serious stuff. Several fundraising activities throughout the year benefit the scholarship fund and help create connections to the local community. These events include our holiday tree sale, an annual raffle or art auction, school yard sales, and fairs. And so, at Agassiz, we march and crawl. Some days, we dance like crazy. We are learning. Check out our Program Options pages for group and day information.